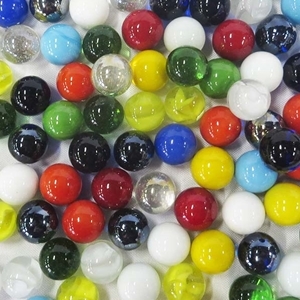 This is an assortment of marbles that are approximately 3/4" (18 - 19mm + or -) in diameter including cat's eyes, pearlies(iridized colors), puries(opaque colors) and clearies(transparent colors). The marbles that appear to be black in the photo are actually a transparent dark amber and transparent dark cobalt. We call these marbles "True Shooters" because they are the only size accepted as shooters in the U.S.A. for tournament play. They are sold in one pound quantities. Quantities of individual styles will vary. Colors and styles may vary. There are approximately 50 - 55 shooters in a pound. Sizes will vary slightly. Warning! : Choking Hazard. This toy is a marble. Not recommended for children under 5 years.